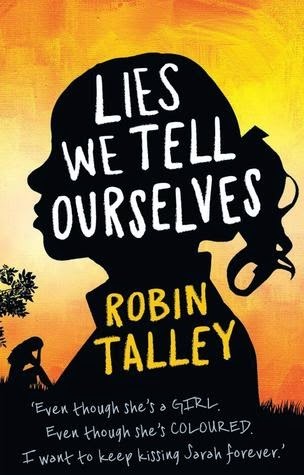 I really enjoyed Lies We Tell Ourselves by Robin Talley. I had been putting off reading it because I knew this book would cover some really serious and upsetting topics. And while at times it was really difficult to read, I still think it was an incredibly important and thought-provoking read. Lies We Tell Ourselves is a story set in a small-town in Alabama in 1959. The first 10 black students will be integrating a formerly all-white high school and the story looks at the final four months of the senior year of two students: Sarah and Linda. Sarah is one of the black students joining this high school and Linda is a white student and the daughter of a journalist who is very outspoken about maintaining segregation. Nobody wants Sarah or the other black students to attend Jefferson High School and Sarah's first day and every day up until graduation day is filled with name-calling and harassment from the other students. With no support from other students, the teachers or any adults, these ten black students are on their own facing all kinds of verbal, physical and sexual assaults from those students who are most upset by the changes taking place. And while everything that happens to Sarah and the other students is really hard to read, what I loved the most about this book is that we see both Sarah's perspective but also that of Linda's. And through Linda, we get a better look at how racist and bigoted attitudes spread and are maintained throughout families and communities. I love the way in which Robin Talley addressed really serious topics in this story. Stereotypes and general misconceptions of black people in particular but also victim-blaming and the way in which those that stand by and witness abuse and bullying without standing up are also complicit in the wider problems and crimes that occur. At the same time as this story of integration is happening there's also another subplot to the story that includes this attraction between Sarah and Linda. I thought this entire story line was quite cute and I really felt for both characters with their conflicted and how guilt-ridden their feelings are for one another. And by confronting their feelings Sarah and Linda both consider different futures and gender roles than to those laid out before them. I love the way in which this book tells a horrific story of racism and abuse and the ways in which these students and families suffered for what they believed in without much hope of change but that this story is also a hopeful one. Without trying to spoil the story in any way, this story ends happily despite the difficulties surrounding both Sarah and Linda and I loved that about this story. I really loved Lies We Tell Ourselves and I really recommend it! Though this was really difficult to read, I think it was beautifully done. A very important book. This one has been on my TBR for a while. I am so glad you enjoyed it.